"It is the summer of 1943 and war continues to rage. For Rose and her sister Diana, it’s a time of independence and self-discovery as they find first loves. But when Rose unearths a love story from another war, she realises that wartime intensifies emotions, and maybe she isn’t in love with Derry as she first thought she was. Rose is about to discover a secret that will change everything..."
With the centenary of World War One's beginning now less than twelve months away at the time of writing, it can at times be difficult to believe that something that still seems so close, in that it affected the lives of many of our grandparents, is yet so far back in the past. 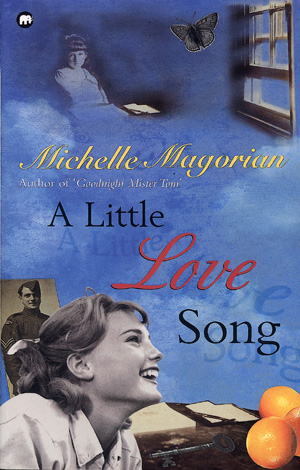 Michelle Magorian's 1991 novel A Little Love Song helps to revive certain aspects of how life was for young people at this time - pivotal not only for being in the synapse between childhood and adulthood, but also pivotal due to taking an important place in a changing world. This wartime setting is typical of Magorian's novels, and here it plays a background rather than mainstream role, while still not being without significance: as a result of the difficulties of the mid-war period, young people are reflected in the novel as more independent, down-to-earth and capable. Even when confronted with challenges, Magorian's characters are still prepared to rise to these and to do their best, even when they are finding these moments tough. Even if this is not an accurate reflection of how adolescents actually were during the early 1940s, this depiction serves not only to give the book's teenage audience an example of good character, but also to inspire readers to admire the characters' resilience. Equally, though, there is much in A Little Love Song to resonate with today's readers - not just in terms of burgeoning independence and sexual awakening, but also in terms of feelings of hopelessness and inadequacy, which are perennially adolescent problems. Magorian is a master at building up sympathy and revulsion in equal measure: in our heads, we rebuke characters for being silly, recoil at arrogant and misogynist behaviour, relate to their feelings, and rejoice in their triumphs. The pace at which this is done is carefully constructed and concise, and we will the characters to cope and to move towards the outcomes that we hope for. All of this shows just why Michelle Magorian has been one of the most successful children's writers of the past forty years, thanks to her reach not only across present generations but also her ability to extend a hand into the hearts of the past.